A 22-year-old male patient presented with progressive effort intolerance of 2-years duration. He was detected to have congenital heart disease during childhood with onset of cyanosis at the age of 5 years. Physical examination revealed central cyanosis (resting saturation: 76%) and clubbing. There was a short systolic murmur at the left upper sternal border and second heart sound was single. A clinical diagnosis of Tetralogy of Fallot (TOF) was considered. Electrocardiogram showed right axis deviation and right ventricular hypertrophy. Chest X-ray was remarkable for the conspicuous difference in the pulmonary vascularity. There was pulmonary oligemia on the left side, but relative hypervascularity on the right side [Figure 1]. Echocardiography confirmed the clinical suspicion of TOF. The right pulmonary artery could not be delineated on echocardiography. Computed tomography (CT) angiography illustrated the origin of right pulmonary artery from the posterior aspect of proximal ascending aorta [Figure 2]. The main pulmonary artery was continuing as left pulmonary artery. Cardiac catheterization data was consistent with TOF [Table 1] and [Videos 1 and 2]. 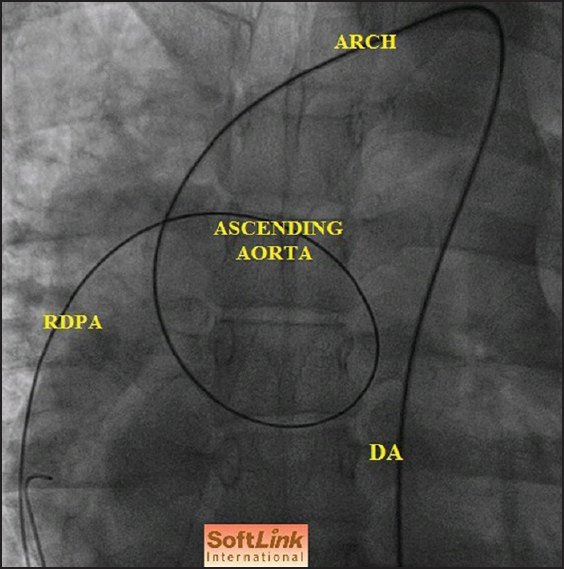 The origin of right pulmonary artery from ascending aorta was illustrated [Figure 3]. 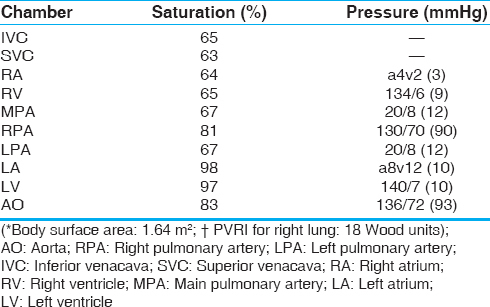 The pressure in the right pulmonary artery was similar to aortic pressure with a pulmonary vascular resistance index (PVRI) of 18 wood units. Patient was advised medical management, in view of pulmonary vascular obstructive disease in right lung. The anomalous origin of a branch pulmonary artery from the aorta (AOPA) is a rare cardiac anomaly, accounting for 0.1% of all congenital heart diseases. This developmental defect results from abnormal migration of pluripotent cells. Defective migration of the right sixth aortic arch to the left side results in anomalous origin of right pulmonary artery from ascending aorta. AOPA is commonly associated with DiGeorge syndrome, TOF, aortopulmonary window, patent ductus arteriousus, atrial septal defect, and interrupted aortic arch. Rarely, it may occur in isolation. In a study by Gan HL, cases of AOPA were reported between 60 days-23 years. AOPA should always be suspected in the presence of differential pulmonary vascularity. 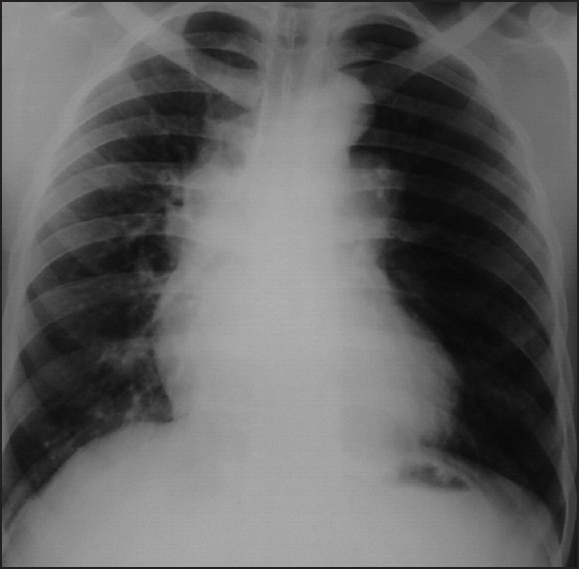 The important differential diagnosis on chest X-ray is a congenital absence of a pulmonary artery. In AOPA, pulmonary vascular obstructive disease develops rapidly. In the absence of surgical intervention, mortality is as high as 70% before 6 months of age. Hence, early recognition and establishment of vascular continuity between main pulmonary artery and branches on the affected side is vital, and reduce the likelihood of complications. There are various surgical options for the treatment of AOPA. It consists of surgical division of the anomalously connected pulmonary artery branch and anastomosis directly, or with a graft to the main pulmonary artery. To conclude, AOPA is a rare congenital cardiac malformation. We report this condition in association with TOF, highlighting the differential pulmonary vascularity. Patel RJ, Zakir RM, Sethi V, Patel JN, Apovian J, Alexander JC, et al. Unrepaired Tetralogy of Fallot with right hemitruncus in an adult. Tex Heart Inst J 2007;34:250-1. Kutsche LM, Van Mierop LH. Anomalous origin of a pulmonary artery from the ascending aorta: Associated anomalies and pathogenesis. Am J Cardiol 1988;61:850-6. Gan HL, Zhang JQ, Luo Y, Wang SX, Li WB, Zhou QW. Diagnosis and treatment of aortic origin of the right pulmonary artery: Analysis of 14 cases. Zhonghua Yi Xue Za Zhi 2009;89:763-5. Arboleda M, Niño de Guzman I, Ticona E, Morales G, Gloria E, Obregon P, et al. 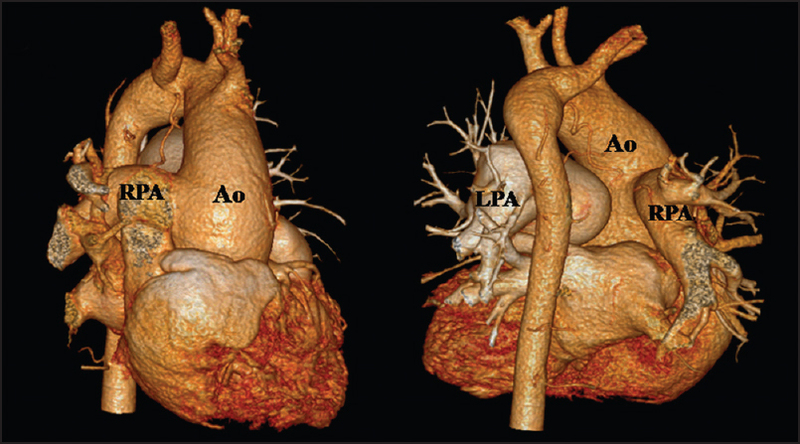 Surgical repair of the anomalous origin of the right pulmonary artery from the ascending aorta. Arq Bras Cardiol 2004;83:519-21.